This report presents the results of Phase II of a project funded by the AAA Foundation for Traffic Safety (AAAFTS) entitled, "The Role of Driver Distraction in Traffic Crashes." The Phase I report for the project contained the results of an analysis of five years of national Crashworthiness Data System (CDS) data, along with crash narrative data from both the CDS and North Carolina crash reports (Stutts, Reinfurt, Staplin, and Rodgman, 2001). The CDS, a part of NHTSA's National Automotive Sampling System, is based on a national probability sample of approximately 5,000 police-reported traffic crashes involving at least one passenger vehicle towed from the crash scene. The goal of the initial phase of the project was to use the available data to identify the major sources of distraction contributing to crashes and to develop a taxonomy of driver distractions that could be used to guide the Phase II efforts. The second phase of the project called for developing and validating a driving log methodology to determine the occurrence in the U.S. driving population of the various driver distractions identified in Phase I. Information on how often and under what circumstances drivers engage in potentially distracting behaviors, and how these behaviors affect driving performance, can help the highway safety community in its efforts to reduce the number of crashes caused by distracted or inattentive drivers. This report presents the results of the Phase II study. The Methods section provides more detailed information on the study methodology and on the formation of the data analysis files. Key study findings that include descriptive results on how often drivers engage in distracting behavior, under what conditions they engage in such behavior, differences among drivers by age and gender, and some consequences of the distracting behavior on driving safety appear in the Results section. A final Discussion section summarizes the study findings and their significance. 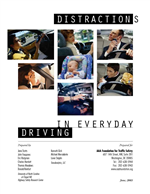 Some types of distracting behavior that people undertake while driving include talking on a cell phone, shaving, putting on eye makeup, eating or drinking, changing a radio station or compact disc, and looking at the back seat to talk to an infant in a car seat.